Last night was a very special night for all that earned the VIP invitation to come to my Sale-a-bration Celebration. All they had to do was spend a qualifying amount during Sale-a-bration and they were invited to my thank you event. We had a quick make-and-take using the Succulent Garden Designer Series Paper (DSP), which happened to coordinate beautifully with my Succulent Garden theme for the night. 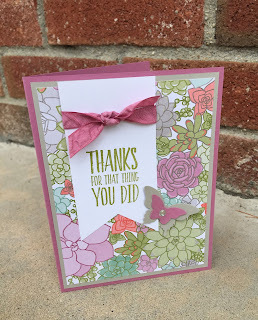 By the way, I also used the Bitty Butterfly punch and the Elegant Butterfly punch on my card -- both are retiring so you may want to purchase them quickly if they've been on your wish list!! Actually, there are a lot of things on this card retiring: the Sweet Sugarplum Ruched Ribbon and the Succulent Garden DSP (low inventory!!) as well! Luckily, the All Things Thanks stamp set is around for another year! I purchased little pots of succulents from Michaels for the table centers. I know Gerber daisies aren't succulents, but I improvised and threw a couple of large Romaine lettuce leaves into the bouquet. You know ... garden-like I guess?! LOL! My favors for the evening were a lot of work to prepare but oh, so pretty! I got the idea from Meg Loven. 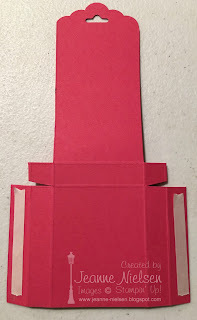 She made a small gift box using the Tiny Clear Treat Boxes from Stampin' Up!. I changed up the cardstock colors but that's about it! Oh yes, and I forgot the ribbon! I decorated the inside and top with a bit of Succulent Garden DSP, and then layered several die cuts from the Succulent Framelits Dies. I used Mint Macaron cardstock for the larger petals, sponging the ends with Sweet Sugarplum ink. The smaller "flowers" were Sahara Sand cardstock (c/s) sponged with Emerald Envy ink. 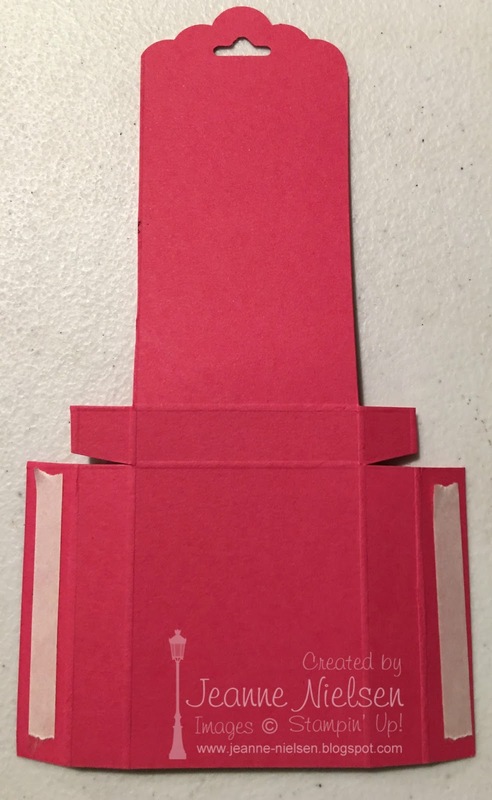 The clear treat boxes are 2" x 2", so I discovered that if I scored the designer paper every 1 7/8" (1 7/8", 3 3/4", 5 3/8" and 7 1/2", it fit perfectly inside the box. That meant that I had 1/2" remaining at the end that I just tucked inside the first score line. Just a hint for the future!! By the way, I tucked tiny packages of M & M's, a Reese's PB cup and some Robin's Eggs inside the little box! We played Bingo and Heads or Tails to determine prizes which were mainly Sale-a-bration stamp sets that I had acquired over the 3 months. Lastly, before everyone left, I gave one more treat: 1 sheet of each color of the Glimmer Paper that was available during the 2nd half of Sale-a-bration (I loved that paper!! ), with approx. 2 yards of the gold and silver glimmer ribbon that was available. I packaged it up in the 4" x 6" and 6" x 8" cello bags with the beautiful gold binder clips! Presentation is everything, but the sparkle inside definitely helped! A special thank you to all of my ladies! Would you like to come next year? It will be a while coming again, but I'll definitely be doing this again next year!! Stay tuned...! I was "surfin' the net" for Easter 3D ideas and came across a cute idea from Erica Cerwin at Pink Buckaroo on her YouTube channel. The original idea was for a Rice Krispy Treat Holder. Since I couldn't find the Rice Krispy treats though, I had to rework the measurements and changed the color of the project to match my chocolate treat! Cut out the tabs that are missing in the photo. Sorry ... I didn't take a before picture! The long tab will be punched out using the Scalloped Bag Topper Punch. If you've scored correctly, the center portion is exactly 2" and fits perfectly into the punch. Go ahead ... push it all the way in! Apply Tear & Tape Adhesive to the 2 side tabs. 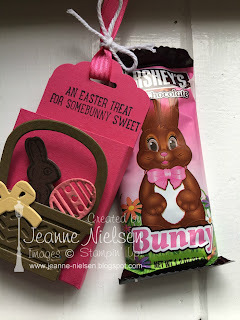 Then, fold them in and up to make a pocket for the little Hershey Bunny! I used Melon Mambo Stitched Satin Ribbon and Thick White Baker's Twine for my accent ribbon. 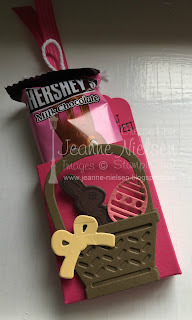 The little stamp is hard to see in the already filled treat so I added another photo -- "An Easter Treat for Somebunny Sweet!" I love it!! For the decorations, I cut out the basket, eggs and bow using the Basket Builder framelit dies. I just love this bundle!! I hope to make a bunch for my coworkers since I'm working overnight into Easter!! A few months back, I posted a picture of my Valentine's sampler. Yep, I've been busy creating, although I'm painfully pathetic at posting my creations!! Today though, I thought I'd share a few closeup photos of the Spring Sampler Class I'll be teaching tomorrow. This is the what I finally came up with, using the Cupcakes and Carousels Designer Series Paper (DSP), the 12" x 12" cardstock from the Falling in Love cardstock (c/s) pack, and multiple stamp sets. I'll list the stamp sets, framelits and "ingredient list" at the end. Comment if you have any questions and I'll answer them as best I can! The outermost cardstock is Soft Sky, 12" x 12", then a 10" x 10" Sahara Sand c/s square (also from the Falling in Love 12x12 c/s pack, then a 9 3/4" x 9 3/4" Whisper White square. The blocks are 3" x 3" of a solid cardstock (c/s): Bermuda Bay, Soft Suede or So Saffron. I chose the colors from the DSP pack although Early Espresso seemed a bit dark for spring, so I opted to use the Soft Suede instead. The DSP is 5 different patterns from the Cupcakes and Carousels DSP pack -- can you believe that I didn't care for that pack to start with?! Now I love it!! 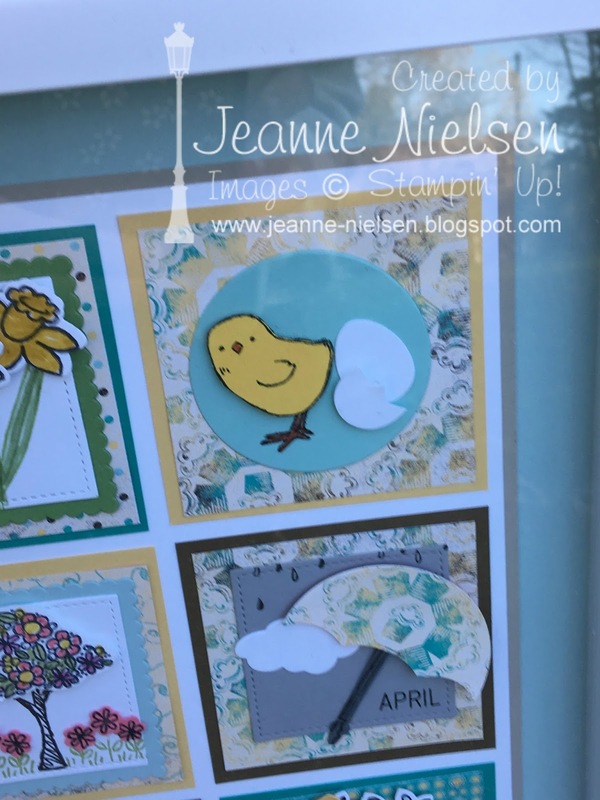 The 2 blocks clearly shown in the photo above are a couple of my favorites: The little chick is from the Little Cuties stamp set in the 2017 Occasions catalog. The little chick from the Basket Bunch was too small in my opinion, although the eggs are from the matching framelits, the Basket Builder framelits. 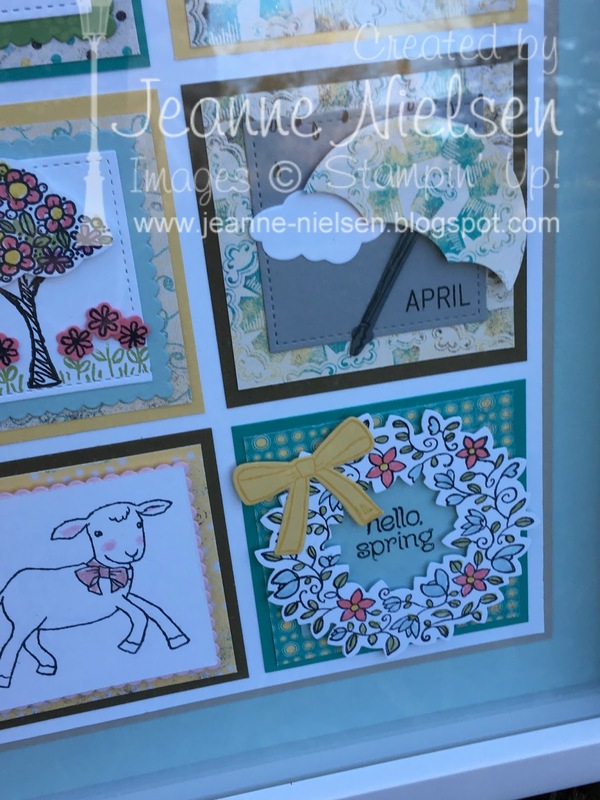 The block below features an umbrella from the Weather Together stamp set and it's matching Umbrella Weather framelits (for the cloud and the umbrella pieces) I stamped "April" using the Project Life Date It stamp set. The raindrops from that stamp set are inked with Basic Gray ink, stamped on a Smoky Slate square stitched framelit. I used this particular framelit size a few times for the sampler frame. The blocks to the right are again my favorites! The top left box is the Basket Builder framelits: I cut the eggs out of Island Indigo and Flirty Flamingo c/s for a "pop" of color (love the Flirty Flamingo!). The square to the right is also from thae Basket Bunch stamp set: I stamped the leaves directly onto the stitched whisper white framelit in Wild Wasabi ink, then colored them in with the matching marker. The daffodil flowers were stamped in Basic Gray ink (because I had 2 ink pads and it's permanent for coloring in! ), then colored with Daffodil Delight marker. 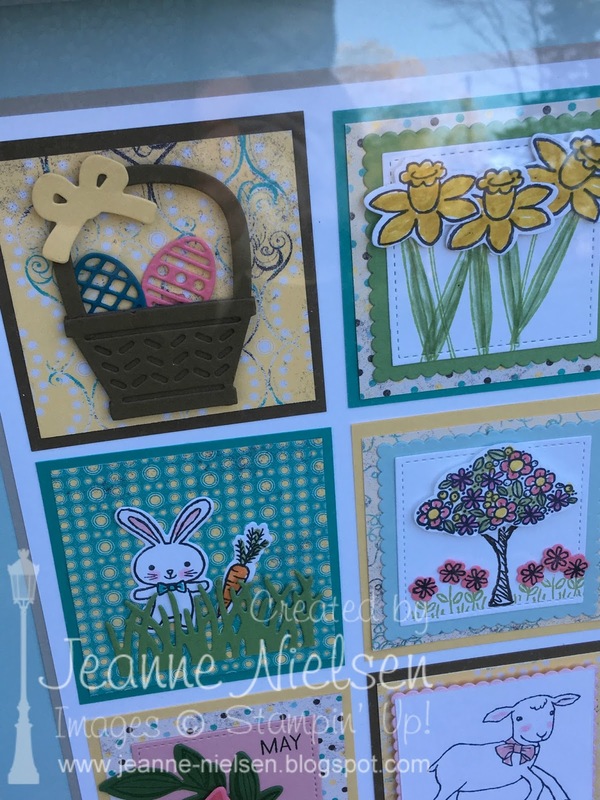 Below the daffodils is a tree stamped with the Sprinkles of Life stamp set, then punched out with the Tree Builder punch (as are the flowers). I colored it in with the Calypso Coral, So Saffron, Sweet Sugarplum and Pear Pizzazz markers. 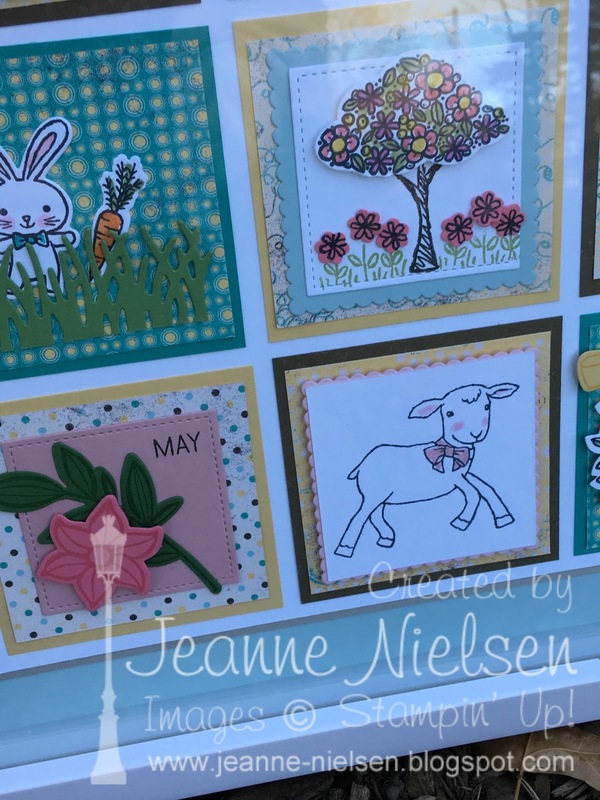 Finally, the left-most block is again using the Basket Bunch stamp set: I stamped in Basic Black ink, then cut out and colored the bunny and carrot. The grass is cut out with the grass framelit: I placed the framelit at the edge of the Wild Wasabi c/s -- the grass is about 1" high. The bottom left and center squares are more favorites... indeed! Again, I used the Project Life Date It stamp set to stamp May. Get it??! April showers brings May flowers! LOL! The flower is again stamped in my favorite incolor ink, Flirty Flamingo on Flirty Flamingo c/s. The leaves are Garden Green ink on Garden Green c/s. The stamp set used is Falling Flowers, with it's matching May Flowers framelits. The little lamb is another "little cutie" from the Little Cuties stamp set! Isn't he adorable with his blushing pink cheeks?! I colored the ears and bow in with Blushing Bride marker, then blushed his cheeks with Pink Pirouette marker. (Oops, I did the same with the bunny in the square above -- the bunny's bow is Bermuda Bay ... say that 5x fast!). The last square was going to be my center square, but it just didn't "work" for me. I used the Circle of Spring stamp set with the matching Wonderful Wreath framelits. The flowers are Flirty Flamingo, Soft Sky, Pear Pizzazz, and So Saffron marker. The bow is stamped with So Saffron ink on matching So Saffron c/s. I bought the frame with a coupon from Michaels: the product is called Studio Decor and it's a shadowbox frame. I've found them in both black and white -- for Spring, I decided that white was most appropriate. So... what do you think?! 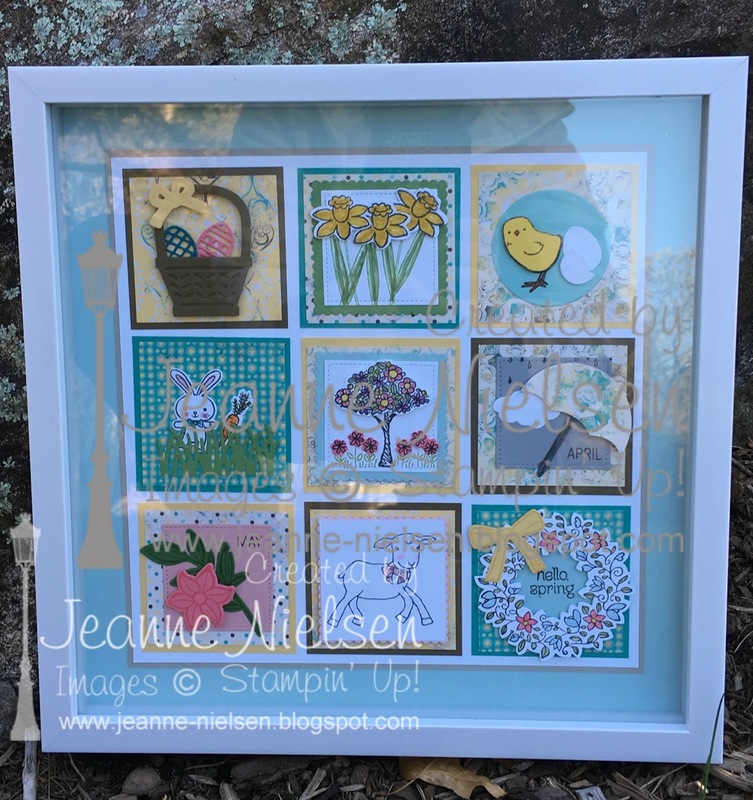 I will tell you that some of these products are on the retiring list for Stampin' Up!, so you have until March 22nd to get the stamp sets (at which time they go to "while supplies last" status. So run ... don't walk! You can click on any of the products below in the showcase to be taken to my store! 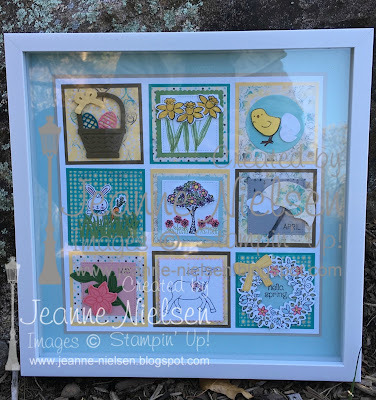 *Retiring stamp sets include the Project Life Date It stamp set, the Basket Bunch stamp set with it's matching framelits (in the Occasions catalog), the Circle of Spring stamp set (with matching wreath framelits), and the Little Cuties stamp set, also in the Occasions catalog. Also, the Falling Flowers stamp set is staying, but the bundle at 10% off will not be available in the new catalog.